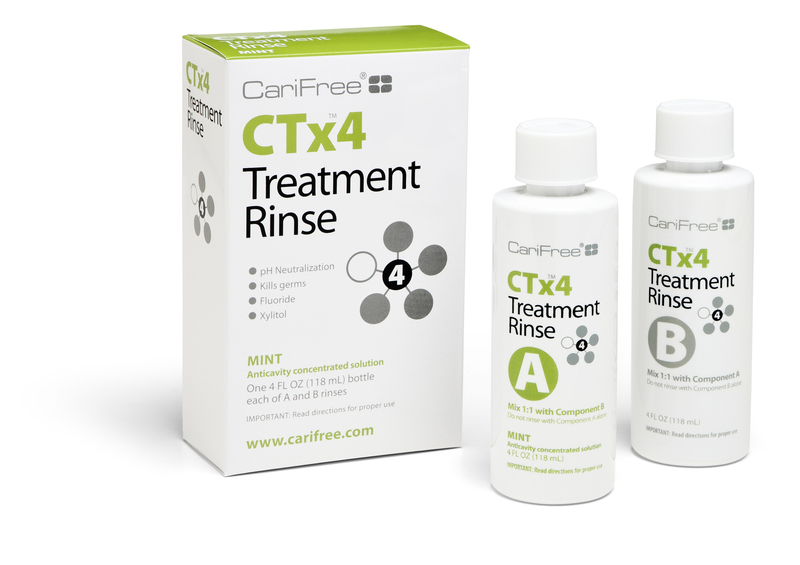 CariFree Treatment Rinse is designed to treat the cavity-causing plaque biofilm, reduce the overpopulation of cavity-causing bacteria, and neutralize decay-causing acids with patent-pending pH+ technology. Intended for use by patients diagnosed to be at risk for caries. Each box includes one 4 fl oz bottle of each component A and B. Use twice daily after brushing and flossing. Shake each bottle before use. Using the measuring cup, combine 5 mL of component A with 5 mL of component B (10 mL total). Vigorously swish the combined 10 mL of rinse between teeth for one minute, then spit out. Do not swallow the rinse. Instruct children under 12 years of age in good rinsing habits (to minimize swallowing). Supervise children as necessary until capable of using without supervision. Do not dilute. Store below 30 degrees C (86 degrees F). Do not rinse with component A or component B alone. Supervise children's use. If more than used for rinsing is accidentally swallowed, get medical help or contact a Poison Control Centre right away. If you experience any unusual symptoms, stop use and contact your dentist.